Author Jay Adams could be described as the Martin Luther of the Biblical Counseling movement. Before he sent out his clarion call to return to the Bible to find out what God says about just who Man is, what Man is like, and what his most important needs are, Christian counselors were turning to secular experts and their secular theories to answer those questions. Adams' insight was that God knows us best, and He knows what's wrong with us, down at the very core of our being in a way that a Freud of a Jung just doesn't understand. In Greg Dawson and the Psychology Class Adams contrasts "nouthetic" or biblically-based counseling with the counseling that is being taught in many Christian colleges and seminaries. He sets up the contrast be making use of a fictional setting. Yes, this is a novel, but it'd be more accurate to call it a textbook masquerading as a novel – the goal here is education, not entertainment. Adams' protagonist Greg Dawson is a preacher who lives near a Christian college. When students attending one of the college's psychology courses learn that Pastor Dawson does a very different sort of Christian counseling than what they are being taught, they come down to visit him, and to pepper him with questions. They want to know the difference between the psychological counseling theories they are being taught and the biblical counseling Greg Dawson uses. So what is that difference? It turns out that the psychology they are learning at their Christian college is based on secular counseling theories, and secular assumptions about what Man is really like. Consider for a moment the hundreds of different secular counseling theories. They claim to be able to explain what Man is really like, and yet the different theories disagree, and sometimes wildly. And how many line up with a biblical understanding of our inner nature? So long as they understand Man outside of his relationship with God how can they understand what Mankind is really like? They won't ever know what our purpose is here on Earth! And most don't acknowledge our sinful nature, so how could they ever get to the sin problem behind marital problems? Pastor Dawson is happy to answer all the students' questions, so every time they meet, the contrast between the two types of counseling is clarified further. Eventually the professor whose teaching the psychology course also comes to visit Pastor Dawson, which is a fun and informative twist. It's not much of a spoiler to say that Dawson proves quite convincing, and most of the students soon quit the psychology course and start investigating how they can do counseling that is based on what God has revealed in his Word. The many Reformers who followed Martin Luther adopted his main thesis – justification by faith – but often disagreed with him on other matters. So too the many Christian counselors who have followed Adams have built on his work, and who have adopted his main thesis – Christian counseling should start with the Bible – have often disagreed with him on some points. So Adams isn't the only expert to consult when it comes to biblical counseling. Others include Ed Welch, Heath Lambert, Wayne Mack, Paul David Tripp and David Powilson. But this book might just be the ideal introduction to the subject – the novel format makes it an easy read, and the clear contrast presented between a psychology taught in a Christian college and biblically-based counseling is certainly illuminating. You can pick it up at Amazon.com by click here. The questions below are meant as a study aid to help readers dig deeply into the book. 1. Nouthetic counselors have been accused of saying all problems are caused by a person’s sin. What do they actually believe? 2. Jay Adams approach to addressing depression is controversial, even among Christian and professedly biblical counselors. Do you think his approach would help in many cases? Do you think it would help in all cases? Why/Why not? 3. What do you think of the three questions at the end of the PDI as described in the book? How could they be helpful to the counselee and counselor? 4. What are Greg Dawson’s thoughts on counseling unbelievers? Do you find his reasoning convincing? 5. Integrationists want to mesh what we learn from the Bible with what we learn from psychology and psychiatry. How is that approach impacted by the fact there are 250 types of psychology and psychotherapy performed in the US? 6. Would biblical counseling mesh with Freudian counseling. Why or why not? 7. 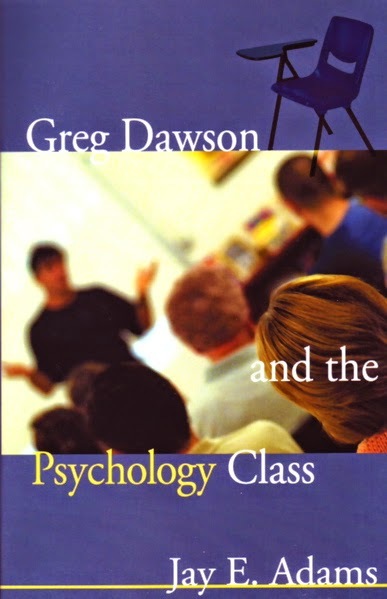 What do you think of Dawson’s perspective on psychologists as (bad) theologians?